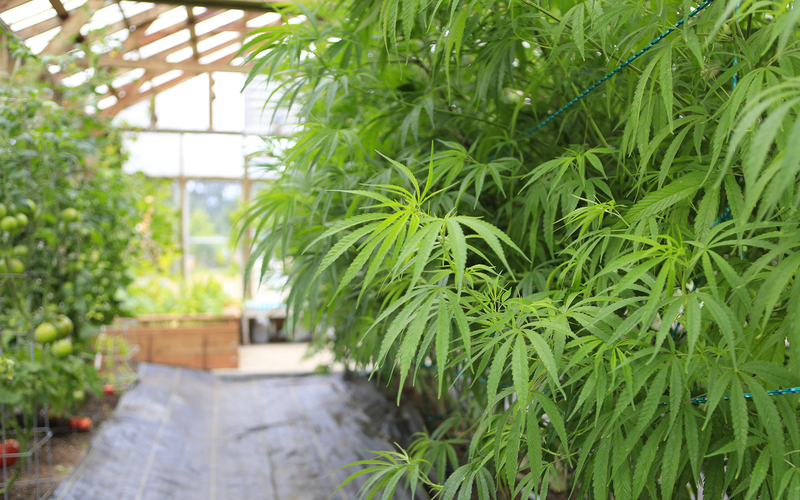 If the federal government doesn’t interfere, the cannabis industry will continue to grow and flourish, which could see sales reaching $17 billion. If the federal government doesn’t interfere, the cannabis industry will continue to grow and flourish, which could see sales reaching an estimated $17 billion. According to the Marijuana Business Daily, this year, the retail sales of both medical and recreational cannabis in the United States are expected to hit between $5 billion and $6 billion. But it might get as high as $17 billion by 2021, thanks to the rapid growth of the recreational market, legalization in more states and further development in existing medical marijuana programs, which will no doubt spur much of that growth. Although, it that is depended on the federal government not disrupting the growth of the green industry. The marijuana industry is primed and pumped for explosive growth in the foreseeable future, provided there isn’t a significant crackdown at the federal level. For this year, sales are expected to grow by roughly a third over the previous year, which had an estimated $4 billion to $4.5 billion in annual sales. It was also the first year that recreational has possibly surpassed medical for the first time, too. 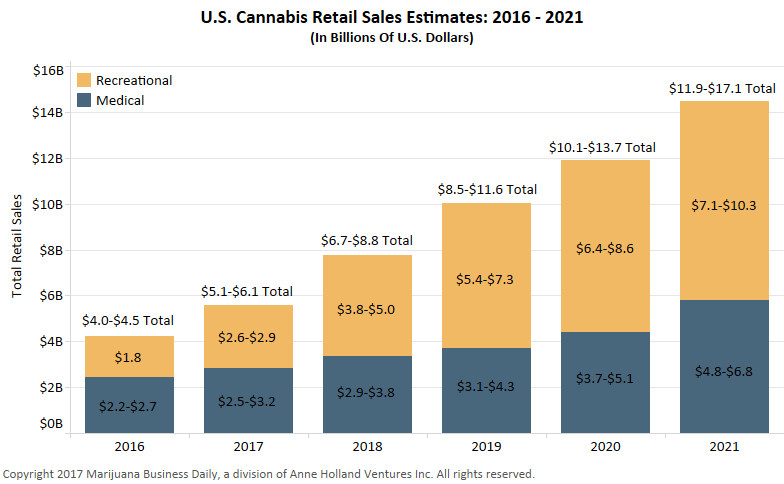 The recreational shops are expected to generate $2.6 billion to $2.9 billion in sales, versus $2.5 billion to $3.2 billion on the medical side. The recreational market will strongly benefit from Nevada’s launch of early sales in July, the continued strong growth in Colorado, Oregon and Washington state, as well as the momentum in Alaska’s market. But, best of all, the longer-term projections are even better. When the 11 states that passed marijuana-related measures come online, the cannabis industry will get a major boost in the coming years, which could generate more than $7 billion a year by 2021 – and possibly much more if they gain steam quickly – in those markets alone. 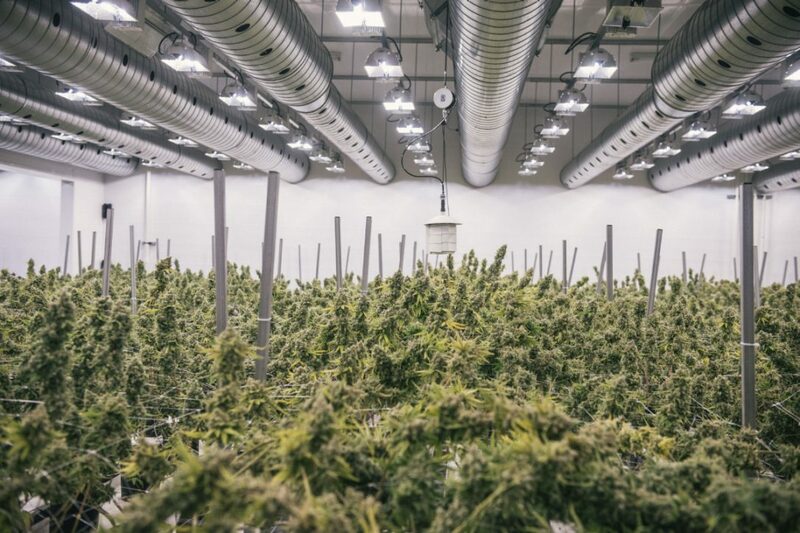 The sales estimates also include wide ranges, just to account for the unknowns in the industry, such as delays in the launch of new markets, legalization in additional states and regulatory fluctuations. While the higher-end ones assume a more promising scenario in terms of legalization and growth, the low-end projections are particularly cautious. And, of course, California’s market will drive the largest share of growth through 2021. Alone, the state could generate close to $5 billion in annual retail recreational sales by 2021, accounting for 76 percent of the total revenue potential for the new recreational markets. Roughly 50% of revenue-generating cannabis companies are either actively trying to raise capital or plan to this year. The situation for these businesses can vary – some are looking for capital to expand while others need cash infusions to pay the bills until they hit profitability – but a higher percentage of testing labs and infused product manufacturers are seeking funding than all other sectors of the industry. With average profit margins of 19%, dispensaries and rec stores are doing quite well in terms of profitability. Though such margins are high relative to businesses in the traditional economy, retailers actually have the smallest profit margins across all sectors of the marijuana industry. Given that annual revenue for a typical rec store/dispensary is nearly twice as high as their operating costs, retailers are obviously hindered by their inability to take the same tax deductions as a traditional business. A majority of infused product companies are manufacturing more than one type of good, typically edibles and concentrates – though less than a quarter are choosing to focus on a single category. For example, nearly half of all infused businesses are producing topicals, but only 6% are manufacturing topicals exclusively. On the employment front, the cannabis industry employs 165,000-230,000 full- and part-time workers.